The secret Andy Warhol banana has been honored again with a new homage courtesy of blues artist John Németh. 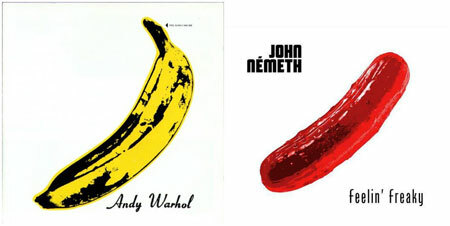 Of course, The Velvet Underground & Nico album honored its 50th anniversary this year and Németh has done his version of the cover with a pink-ish pickle for the album Feelin’ Freaky but my thought was didn’t Kosha Dillz do a regular green pickle recently and that wasn’t meant to be an inquiry, it was my way of saying someone else already did the pickle idea. Yet Németh might say “oh, but it’s a pink-ish pickle.” Aaah.